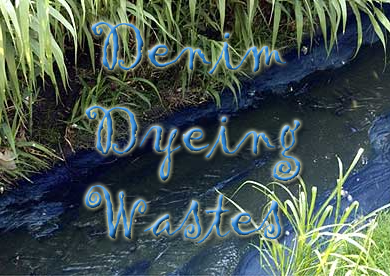 The problem of treating wastewater from denim dye waste is significant in many developing countries. Either the costs of treating these wastes affects profit margins or the waste goes untreated and is discharged directly into rivers. 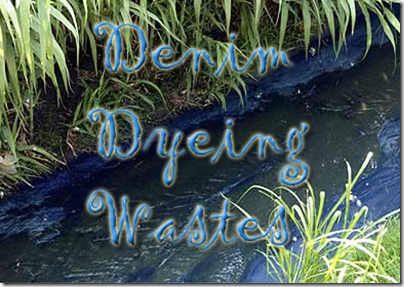 The most serious pollution problem results from the use of sulfur dyes in denim. Once the sulfur dye is applied the cotton is squeezed and washed. Typically, 50% or more of the sulfur dyes are washed off, producing water contamination that is difficult to remove from water. Unlike most types of cotton dyes, sulfur dyes can be recovered and re-used. The contaminated water from sulfur dyeing usually contains enough dye and chemicals to produce lighter shades without additions of dye or chemicals. For example, the wash-water from sulfur-black dyeing can be concentrated through evaporation, filtration or it can be re-used by adding enough dye and chemicals to produce the standard shade. There are methods for titrating sulfur dye with copper sulfate, reducing agents can be added to bring the ORP to the correct level and the alkali can be titrated with a 2-endpoint titration with HCl and formaldehyde. Using these techniques, the sulfur dye can be recycled which saves money and ends the pollution. It should be noted that sulfur dyes precipitated with an acrylic type flocculant cannot be re-used. I have developed methods for sulfur dyeing that fix the dye completely, so that none is lost in washing, leaving the wash water completely clear. Depending on the quality of the dye, which reducing agents are employed and the pH of dyeing, various inexpensive buffers can be employed that will fix 100% of the dye which eliminates the colored waste and also reduces the amount of dye needed by a sulfur black shade by 50% or more.These methods were developed over a 20 year period and have employed them in Brazil, Ecuador, Indonesia, Phillipines and Thailand. There are also cold-dyeing methods that also eliminate the dye waste 100%, saves energy and has colorfastness approaching that of a vat black. Reducing agents are a major source of Chemical Oxygen Demand. Sodium dithionite sold commercially as sodium hydrosulfite has a COD of 0.22 kilograms per kilogram of 100% hydrosulfite. Since it is normally produced using zinc metal as a catalyst, there is also some presence of heavy metal contamination. There are non-polluting substitutes that can be used with many Indigo-dyeing methods. Sodium sulfide-type reducers are commonly used, however they can be easily replaced for hot-dyeing methods with reducing sugars which includes sugar, dextrins (corn-sugar) and molasses. These have been offered by chemical companies for decades and basically break down under conditions of high temperature and high pH (11) into hydrogen and alcohol, which both escape into the air. Sulfur blacks do not require chemical oxidation, in fact peroxide will reduce the colorfastness of sulfur blacks and acid-oxidation will weaken the yarn. – After applying sulfur black, it should be allowed to cool in air which takes the dye out of reduction and allows oxidation with atmospheric oxygen. The initial washing should be cold in order to avoid washing off any color and also to allow further oxidize with oxygen-rich cold water. The final wash should be warm, about 60 degrees, which will remove alkalies and residual reducing agents. If noticeable color is removed, the dyeing procedure requires adjustment.